The Angriest: Star Trek: The Next Generation: "Starship Mine"
It is 29 March 1993, and time for another episode of Star Trek: The Next Generation. 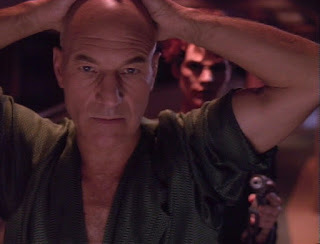 After the Enterprise is evacuated for periodic maintenance, Captain Picard (Patrick Stewart) reboards the ship - only to find it taken over by mercenaries on a raiding mission. While his command crew are held captive on a nearby planet's surface, Picard is forced to single-handedly take back his ship by force. "Starship Mine" is an unashamed riff on the popular 1988 action film Die Hard, in which hostages are taken, a heist is performed, and a single man with a gun is forced to save the day all by himself. It is a fun episode because it provides some straight-forward action and adventure, but it is particularly fun because it does all of that with Patrick Stewart playing the man with the gun. Some episodes of Star Trek: The Next Generation are science fiction masterpieces. Some provide intellectual debate on social issues. Some just run around punching and shooting people. Patrick Stewart rises admirably to the role of action star, and indeed with his gravitas and dramatic chops he actually makes for a particularly nuanced and interesting one. He uses smarts, brawn, resolve and trickery as he sneaks around the Enterprise, hopelessly outnumbered and outgunned. Obviously the episode's budgetary and shooting schedule limitations do reduce the potential for particularly inventive or outstanding action scenes, but what the episode achieves is pretty impressive within the context of the series - and certainly very entertaining. The other side of the episode, in which Commander Riker (Jonathan Frakes) and his crewmates are held hostage during the raid, is somewhat less successful. It beggars belief that several trained Starfleet officers can be held successfully by two nervous aliens with guns for as long as they are, and keeping everyone in the room requires a certain handling of the 'idiot ball' (a metaphorical ball you throw to an otherwise smart character to make them do foolish things). The episode also shies away from precisely where everybody else is. Picard is on his own on the Enterprise, the rest of the regular cast are locked in a reception hall, so that just leaves almost 1,000 other people from the Enterprise whose actions and presence are entirely unaccounted for. To be honest, criticising the subplot feels like quibbling when the core story does exactly what it says on the tin and gets out with brevity and flair. This is not a complicated episode, but then neither is it trying to be. You would not want Star Trek: The Next Generation to be like this every week, but now and then a little superficial action can do a series good. This is the 12th good episode out of 18, giving Season 6 a rolling quality ratio of 67 per cent.